The challenge this week at For Fun Challenges is Bunny BUT NO Easter! We were sponsored by KnK Designs but prior to our challenges she decided to close up shop so these images are no longer available. BUT if you play with us this week you will have a chance to win the images that were used by the design team! So it is worth playing along with us this week as these are discontinued stamps at the present moment! I decided to turn this scene into a winter scene for a Christmas Card. I used white flower soft for the snow, pop dotted the fire so give it dimension above the snow, and the snow flakes were punched with a small hole punch. I added some snowflakes to make it look more random. This was my first time coloring in the background…which I made a night scene. Not the greatest night sky but it works. 1) For Fun Challenges – Bunnies but NO EASTER! The challenge today at Clearly iStamp is SPRING!! I struggled a little with what to use on this challenge. The images I thought that would work perfectly I had already used lately so didn’t want to use them again. This image came out a month ago and I didn’t get to use it then so I figured this was a perfect time to play with it! I paper pieced the image and used up some Doodlebug Scraps I had. I decided to make two cards for this challenge while I had the supplies out. And here is the other one using up the supplies I had on my desk! 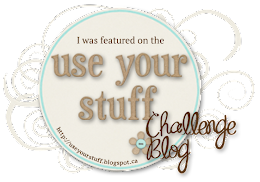 Remember the Clear Dollar Stamps Blog Hop I was part of on Sunday! Well, the winner was picked from MY BLOG!! Yippee!! Don’t worry if you didn’t win this time because we do the blog hop every month so come back in May! Oh and join us in our challenge that starts tomorrow, Clearly Inspired Challenge #50, for another chance to win great prizes. Congratulations to Paula-Kay of Creative Stamping With Paula-Kay. 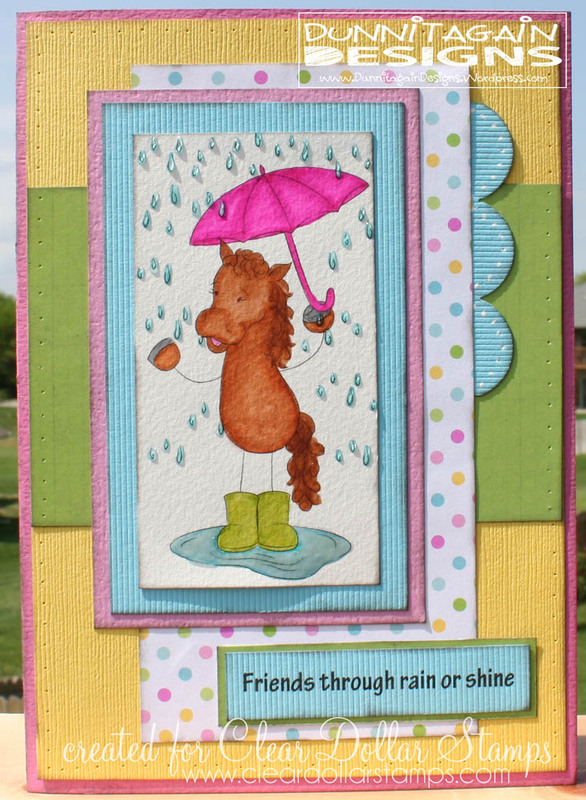 You are our winner of the Clear Dollar Stamps “We’re Not Horsin’ Around” blog hop. 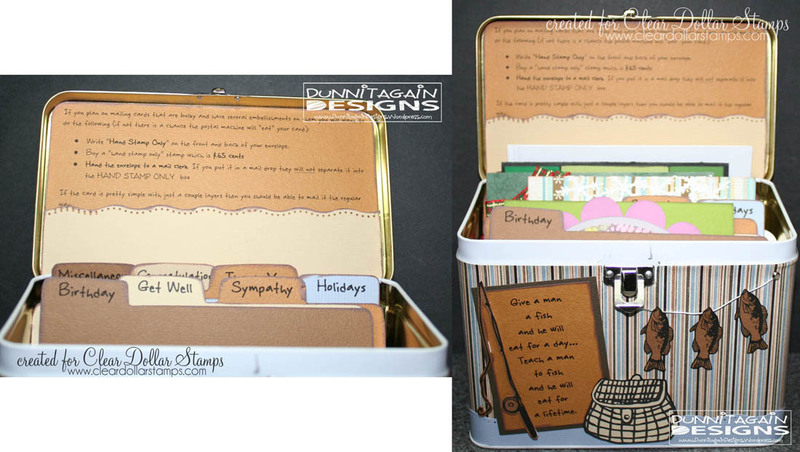 A Handsome Greeting Card Organizer! Thanks to For Fun Challenges I finally got the Masculine Greeting Card Organizer done for my Father In-law….it has only taken me 5 years but it’s done! My Mother in-law and Sister in-law love having my cards on hand to give out to people. So I decided one Christmas to make them pretty tins to be able to keep the cards in. Then a couple times a year I would refill their stash. When my mother in-law passed away in 2006 my sister in-law took the cards and added them to her collection but didn’t need the tin. So I think it got thrown away or given away (can’t remember). At the time we didn’t really think my father in-law would have use for it since he doesn’t send out a lot of cards. Well, we were wrong. We got a call one day asking where the card box went so we told him and he said he was looking for it so he could send a card out. So I told him I would make a “manly” box for him to keep his cards in. I have given him cards to use but just haven’t got around to making the tin. I realized I didn’t have any more tins that opened from the top and was the right size so last month a friend of mine gave me an extra one she had. Then Helen at For Fun Challenges decided to REALLY challenge us with a ANYTHING BUT A CARD CHALLENGE. I decided this was the perfect “kick in the pants” I needed to get it done. 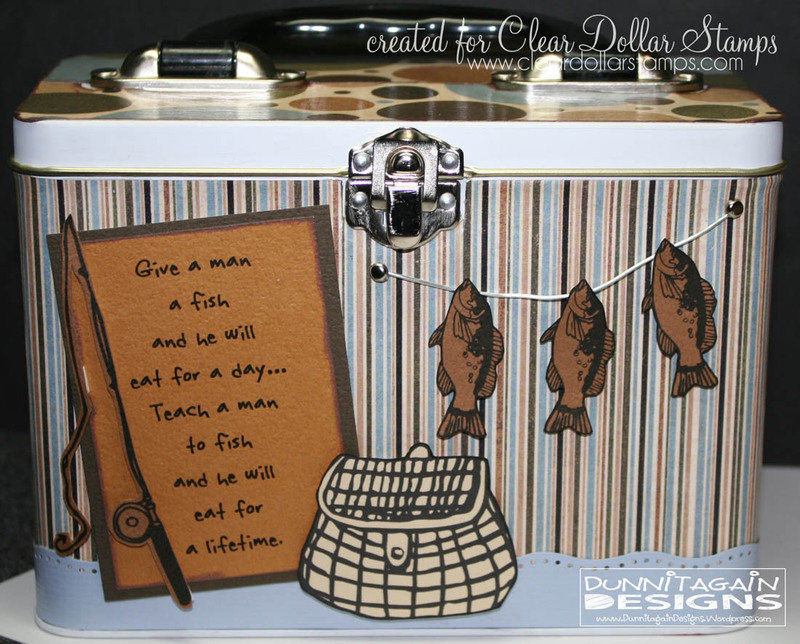 I had some cool looking manly paper (same paper I did the fishing card out of last month) and paired it with the Time to Fish Digital Image from Clear Dollar Stamps. My husband helped me by telling me it needed the fishing pole and fish on there with the basket. I came up with the metal stringer and brads…which I think turned out cute! I actually think the WHOLE thing turned out pretty awesome! On the inside lid I placed instructions on mailing bulky cards….they cost more and you have to put “hand stamp only” on the envelope and hand the envelope to the mail clerk. Then I added the light tan piece to make a pocket to put some of the 65 cent extra posting stamps in there for him. That way he can keep them in there since they are for the cards. 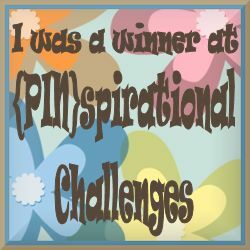 I hope the challenge will inspire you to do something you have been wanting to do but haven’t had time! Put down the card making supplies and do something different!! 1) For Fun Challenge – Anything BUT a card. Can be a sewing, quilting, scrapbook pages, altered items, cakes, kids crafts, etc…. 2) There She Goes Challenge #152 (TSG152) – Cards or project for Dad! We are challenging you to make a card or project for Dad. Whether it is a gift set, scrapbook page, or card, focus on Dads of all kinds! 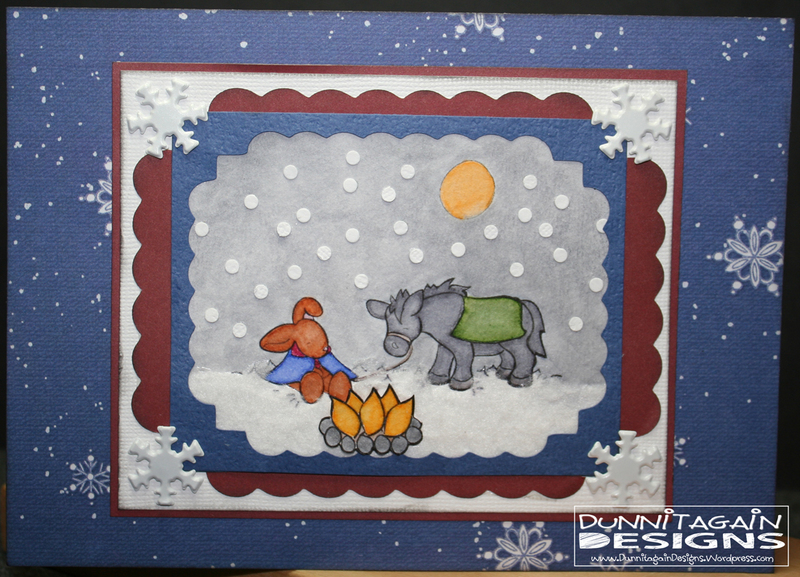 3) Penny’s Paper-Crafty Challenge #77 – Anything BUT a card. April 2012 Digital Stamp Release Day!! It’s digital release day at Clear Dollar Stamps!! The first stamp I will show you is Bless My Bloomers There are so many possibilities with this stamp. I chose to work with the flowers in the flower pot this time but I can see getting a lot of use out of this set! Check it out and you will see what I mean. The second set was so perfect for me. I needed to make a sympathy card for a couple at church that just lost their newborn that had been born with some complications. I wanted a cross with something below to symbolize a baby. DeeDee must of read my mind because this was in the NEW Digital Release for April!! The set is actually called Become New Digital Image but it was perfect for the sympathy card too. This is only a SAMPLE of the awesome stuff released this month. So please stop by Clear Dollar Stamps to see ALL the other stamps. Okay, maybe we are a little!! that can be found at Clear Dollar Stamps. If you are just joining us head on over and start at the beginning on Lori’s Blog. 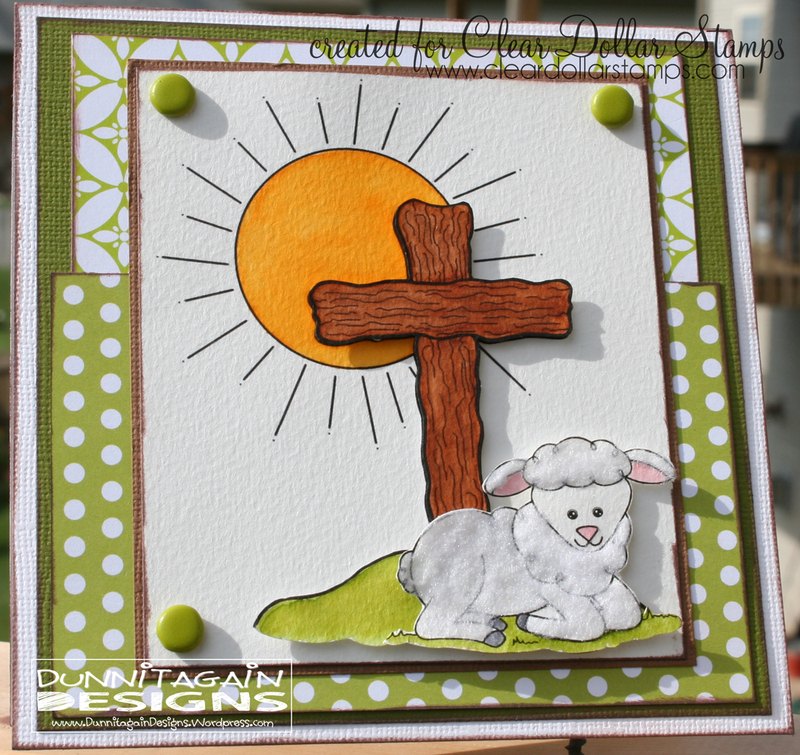 If you just came from Linda’s Blog – The Stamper’s Touch you are in the right spot. 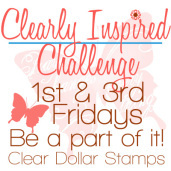 For hopping along with us One lucky winner will receive a $25 Clear Dollar Stamps gift certificate for digital images! The Winner will be randomly chosen from comments received on a DT member’s blog. The winner will be announced on my Blog and the CDS blog Thursday, April 19, 2012.
work on at my own pace. But I managed and I’m happy with the results. 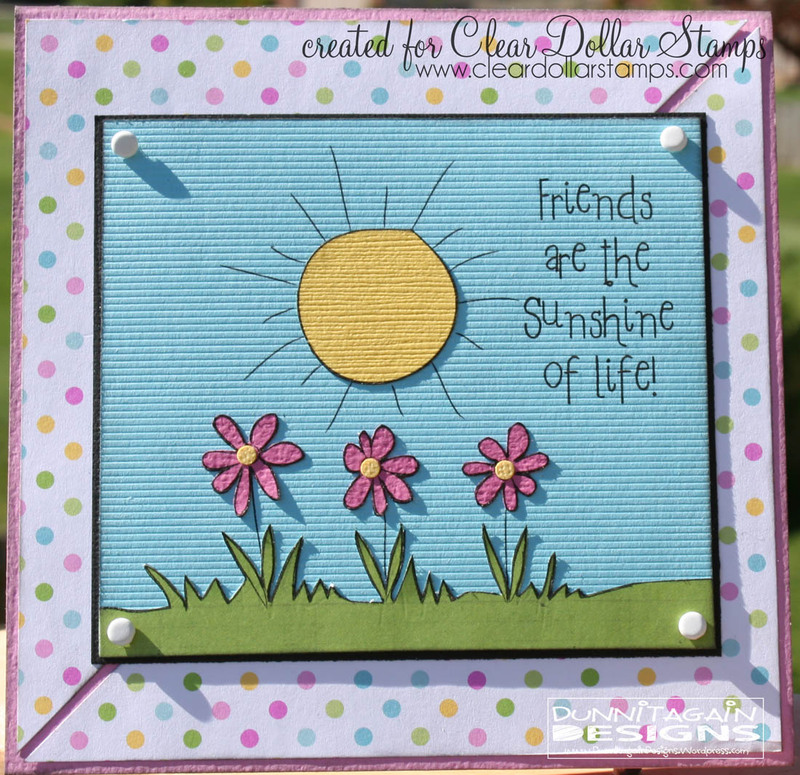 I used Charliene April Showers Digital Image from Clear Dollar Stamps. to make a “scene” and in less than 5 min I have this totally cute scene of Charliene in a puddle! I colored her in with Tombow markers then I found the perfect paper in my Doodlebug stash (just LOVE them!). I used sketch #46 at Deconstructing Jen for my inspiration. You can’t tell from the photo but the raindrops and puddle are glossy to look real! Your next stop on the hop is Barb’s Blog – Barb’s Best Creations. Thanks for taking a HOP around all the blogs. Hope you left comments on all the blogs as you never know which blogs the winner will be selected from. Thanks for stopping by and saying hello! 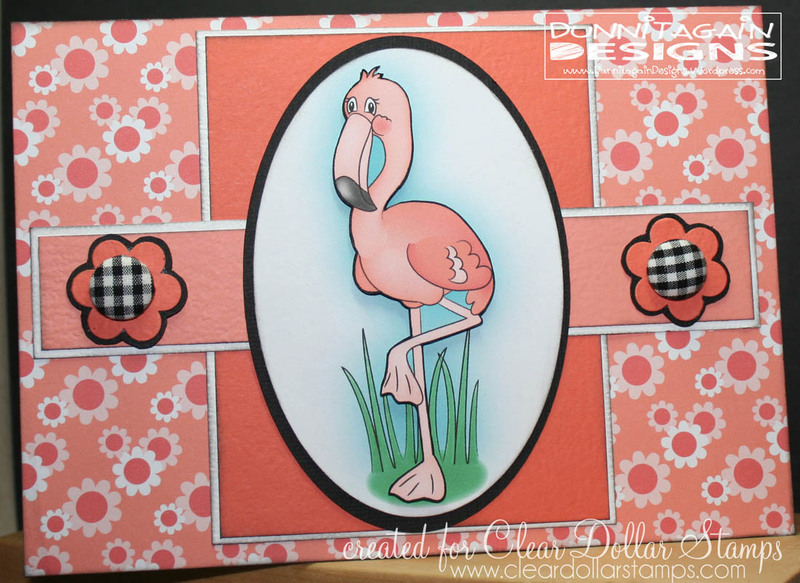 1) Card Makin Mamas Challenge – Getting Girlie. 2) The Deconstructed Sketch #46 – Use the sketch provided as inspiration. I didn’t make it during the challenge week but it still inspired me! I made this card for a guy at work that ordered a Flamingo Birthday Card for his grandmother. You can’t tell in the photo but the flamingo is pop-dotted on top of another one to give it a 3-d look. I sure hope he likes it! 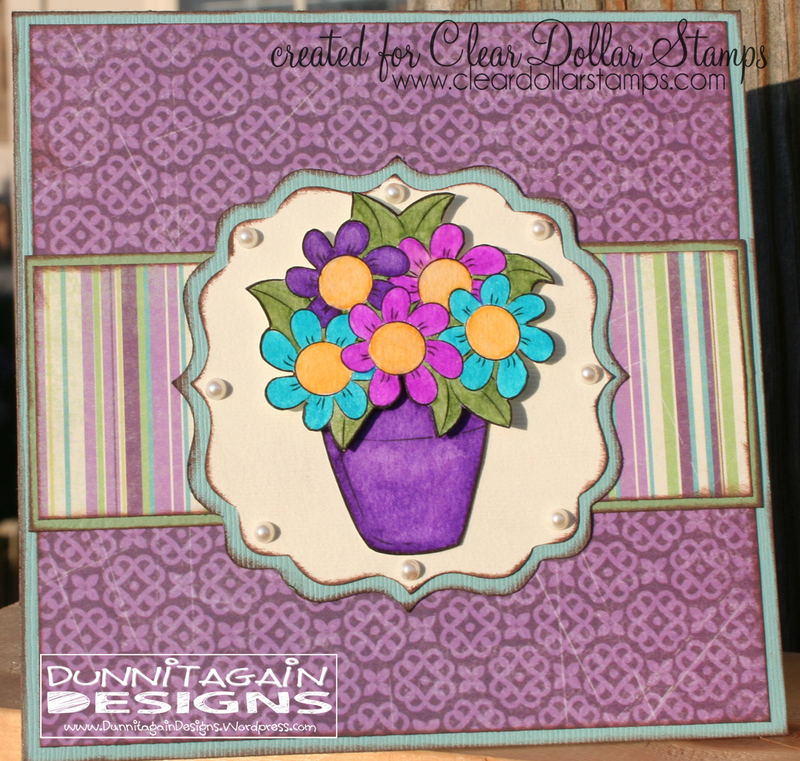 1) Crafty Creations #165 – Flower Power. 2) Totally Paper Crafts Challenge #112 – Things with Wings. 3) Fetch a Sketch #21 – Use the sketch provided as inspiration.